Judging Billy Lynn’s Long Halftime Walk based on its sheeny surface level seems practically unfair. Less than a handful of theaters in the entire country were able to actually project the film how director Ang Lee intended, in 3D and a disorienting 120 frames per second (by comparison, your standard movie runs at 24 fps). It’d be like reading this review in a foreign tongue; its effect would be lost in translation. But that’s not why Lee’s scattered harp of a picture misses so many notes, awkwardly plucking at heartstrings and holding strange pauses. Billy Lynn wants to be an anti-war courier, framed through the commercialization of the media, putting us into a restricted POV mindset. Rarely does it ever work, even if Lee’s film deserves to be admired for its ambition as much as it should be condemned for its pitiful, heartless execution. 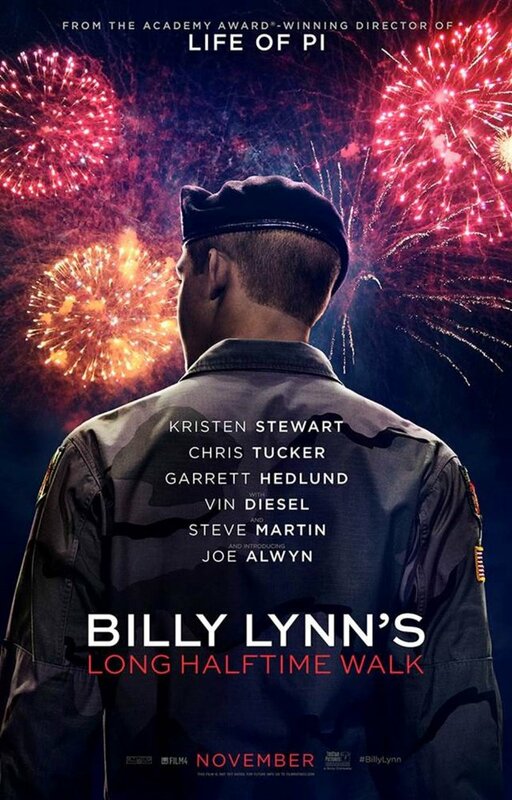 Billy (Joe Alwyn) has become the latest poster boy for the war on terror, immortalized in the vein of World War II’s Raising the Flag on Iwo Jima, his pistol drawn image racing into the hearts of Americans as quickly as he rushed to the aid of his gunned down Sergeant Shroom (Vin Diesel). He’s shipped around the U.S.A. alongside his comrades like a Disney on Ice promotional stunt, selling heroics and freedom to the masses through the traumatized psyche of forever altered young men. The tour at home proves to be more strenuous than that of their time overseas, culminating in a big halftime appearance during a Thanksgiving Day football game. 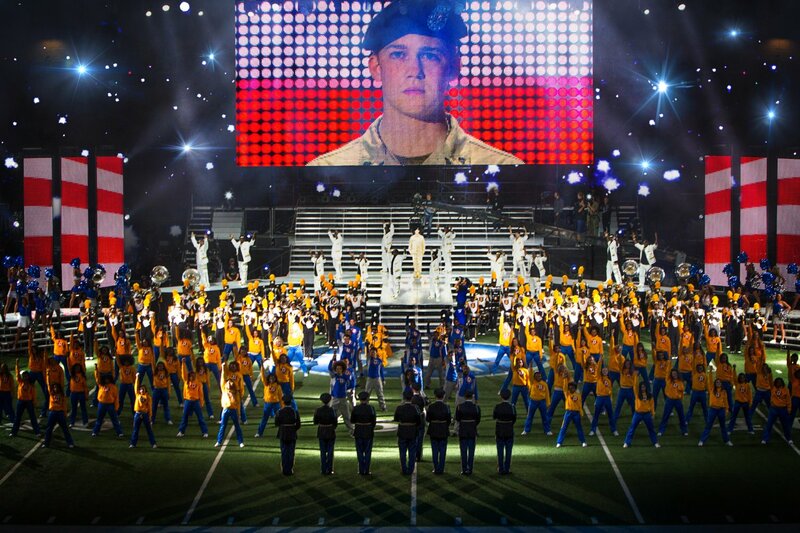 Billy Lynn flashes back and forth between the buildup to the sporting event and the battle in Iraq, and only once does the editing connect the separate plots with purpose and skill. I imagine the picture being more impactful had it been more straightforward. It’s hard to make sense of this vacant minded movie. What does the relationship between Billy and his sister Kathryn (Kristen Stewart) signify? What is the importance of Billy’s tangential fling with cheerleader Faison Zorn (Makenzie Leigh)? Why is everything so clearly manufactured and cheap, so robotic and inhumane? Ang Lee has established himself as one of the most symbolic directors of his generation, but for whatever reason, he’s chosen to direct a flatlining film with no heart, no soul, and no brain. I understand that Billy Lynn’s blocky structure and its atypical tone are both purposely in place to impart the ambivalence of a soldier’s detachment from an unfitting and altered worldview. Lee does this and breaks free from the typical conversational angles of cinema, defying the standard shot-reverse shot formula so the audience is spoken to directly, as if we in fact are Billy. Like our protagonist, we are left stunned, a deer in headlights, unable to provide the type of reactionary response this movie so desperately tries to ascertain. The perspective of Billy Lynn is what makes the picture look as distanced and absent as it ultimately feels, because through the prism Lee has presented this story, the viewer’s hands are left either tied or submitting to the film’s clasping overhand grip. There must be a logical reason why Lee intended to make this movie feel so fake, so phony, so contradictory in its assemblage of personas invading the screen. Why can’t we name this team the Dallas Cowboys? Why can’t we call their owner Jerry Jones? Why only show the backs of “Destiny’s Child’s” heads while interrogating Billy with the likes of real NFL superstars Richard Sherman and J.J Watt? During every such instance, the movie suffers from collapsible human relationships and an insufferable sense of hyper awareness. Rather than standing its ground and walking the walk, Billy Lynn’s Long Halftime Walk clumsily balks the balk. How the best trailer I’ve seen this year was made from such a distracting, tawdry, and histrionic film is incomprehensible.